(all done for under $150). Okay, so maybe like two of you were waiting for it...."all" might have been a bit of an exaggeration - haha! And now on to the features and then the party!! No surprise to me that it was Rita from Curbside Creations little table. Isn't it GREAT?! 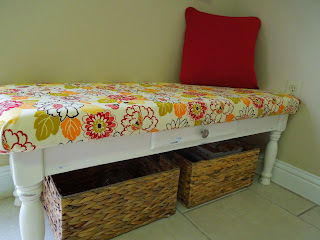 Next up is Linda from Inspried Apartment with the coffee table she made into the most adorable chic bench ever!!! Check it out - I totally GOTTA DO THIS. (Yes, I have a few coffee tables sitting in various buildings outside... haha). And last but not least. Ohhhhh it was a hard choice. But I just fell in love with this hutch from Erica at Three O'Clock Winds. Well done! 4. Your post can be from 3 years ago, just so it's new to Trash 2 Treasure on Kammy's Korner! Ireally hate to delete links!! And I've seen Erica's hutch featured elsewhere, it is sooo fabulous! SWEEEEEETTTTT!! thanks for the feature! I feel so special and loved! Hi Kammy - Thanks for hosting the party! I'm a new follower! Off to check out all the shares!